In February of 2015 I decided to upgrade my Clevo P150SM's GPU from the Nvidia GTX 770m 3GB it originally came with to a GTX 980m 8GB. After a bit of research which turned up no definitive information about if it was possible to get an upgraded GPU working in a Clevo P150SM which does not have BIOS support for new Maxwell cards. I decided to go ahead and buy one anyway just re-sell the card if it was incompatible. I bought my GTX 980m from Mythlogic, if you would like to buy an MXM card, just email them to get an estimate. My card happened to come with a heat-sink. 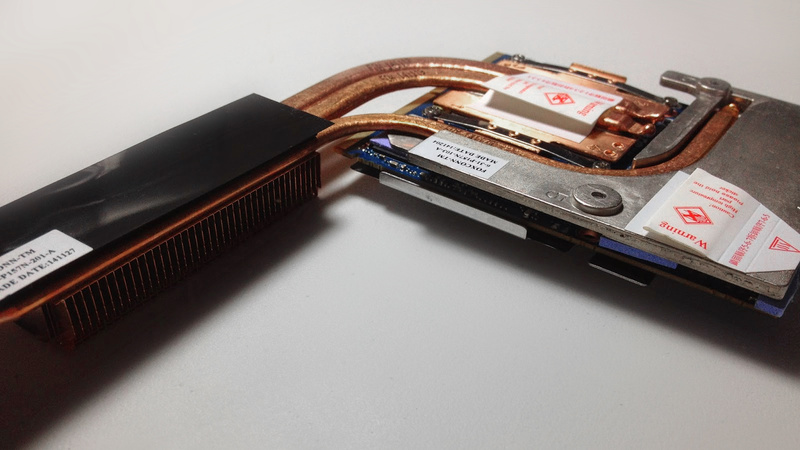 If yours does not, the original 770m heat-sink is compatible with the 980m if you add some extra thermal pads for the larger VRM. Physically installing MXM cards is pretty straight forward, if you have ever installed laptop RAM and a CPU cooler this should be a walk in the park. After removing the bottom cover of the notebook, unscrew the 4 silver screws from the GPU block and the 3 screws from the memory/VRM portion of the heat-sink, then gently lift the heat-sink off of the MxM card. There will be 2 screws holding the card in place (I needed a wrench for one of them) unscrew these and the card should raise up so that you can pull it out in a similar fashion to SODIMM RAM modules. Repeat this process in reverse to install your new card. Cooling may be an issue, I was having trouble keeping my 980m below 80c until I made significant hardware mods. This should not be an issue for most as you can buy a Clevo P150SMA which comes stock with a 980m and they are just fine. My heat-sink ended up having a bent cold-plate and was not making proper contact with the GPU die. Power can also be an issue, I have a 180w power supply which will pull anywhere from 220 to 300 watts from the wall when gaming with my 980m overclocked. I would not recommend using a 180w power supply as you run the risk of damaging the power supply and possibly your laptop, not to mention the fire hazard that comes with running a power supply over it's rating.